I have a love-hate relationship with this Old Navy wrap-front hoodie. 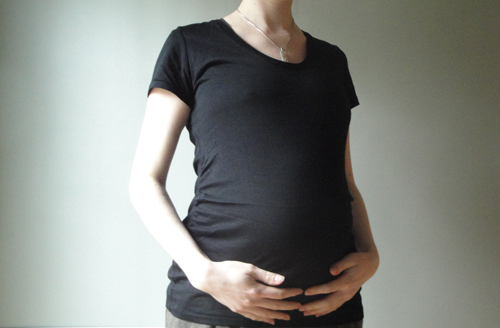 At the recommendation of a friend, it was one of the first maternity items that I purchased. I believe I bought it back in January before I even needed maternity clothing. 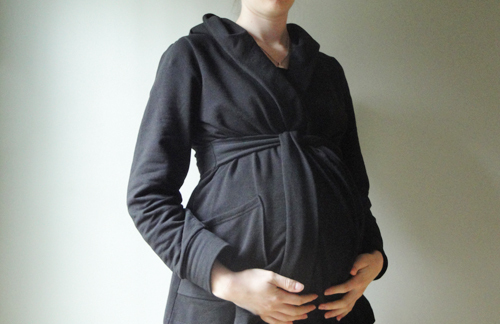 I figured it’d be handy to have a black sweatshirt I could grow into, but I didn’t wear it for months because all of the extra fabric made me look like I had a giant belly. And this was before I was even showing! Now that I have a legitimate belly, I’m still hesitant to wear this hoodie out in public despite the fact that it’s comfortable and it “fits.” Why? Because I think it makes me look like I’m due to give birth any minute. In the above photo, I’m wearing the sweatshirt over a black Gap maternity t-shirt. Below, I’m just wearing the t-shirt. The proof is in the pictures, people. Last weekend, at the start of 26 weeks, I passed a neighbor I hadn’t seen all winter while we were both walking our dogs. She congratulated me on the pregnancy. “I saw you from my window the other day as you were walking down the street, and your belly was leading the way,” the sixty-something-year-old woman said. I politely chuckled and told her that I’m due in July. She replied that I looked large for having a July baby and inquired if I was having multiples. It boggles my mind the things that people think is appropriate to do/say to a pregnant woman. It is not OK for you to remind me how large I look, just as it wouldn’t be OK for anyone but a super close friend to ask me if I was trying to get pregnant or to reach out and touch my belly. Have you been in any of the aforementioned awkward situations? How did you handle it? Is it wrong to buy one of these adorable blabla dolls under the guise of giving to the baby when really I want to keep it for myself? These adorable dolls are hand knit in Peru and meet my newly discovered criteria for children’s toys: simple and slightly quirky. I always vowed not to be one of those pregnant women who constantly complains about how fat she looks. Before I was knocked up, it annoyed me when those with child moaned about their expanding girth. “You’re not fat! You’re pregnant!” I cried in response. Maybe it was because I was jealous that they were pregnant and I wasn’t. They had something I wanted, so I didn’t want to hear them grumble about it. Plus, as a non-pregnant person, I couldn’t relate. I won’t tell you how much I weigh because that’s none of your business. Truthfully, I don’t even know how many pounds I’ve packed on because I only step on the scale once a month at my doctor’s office. Plus, I’ve found that pregnant women are just as competitive about how much weight they’ve gained as skinny women are about how much they’ve lost, and I refuse to partake in that game. I will tell you that my body shape is changing, and I’m not comfortable with it. Now I understand why pregnant women complain. They don’t feel like themselves. Around 10:30pm recently, I looked down at my feet and let out a wail. I think when you’re pregnant, your eyes play tricks on you. At least mine do. On Tuesday JB deployed for two months. He’s scheduled to return about six weeks before my due date. I don’t know if I was extra emotional because of all these crazy pregnancy hormones, but I spent the majority of the week in tears. This is not our first time apart, but I imagine it will be the hardest. Thankfully my mom was able to fly in before he left so that I’d have company for a couple of days. Hopefully all of the tasks on my never-ending To Do list will keep me busy for the next 8 or so weeks. I have to make final decision on paint colors and furniture for the baby’s room, and I’ve been encouraged to create a registry. One of my immediate goals is to learn how to crochet because there is a blanket I’d like to make for the our little guy. I’m sure he’ll be gifted plenty of knitted goodies, but I think it would be special if he had something handmade by me. Turning 30 last year was hard for me. I felt isolated. 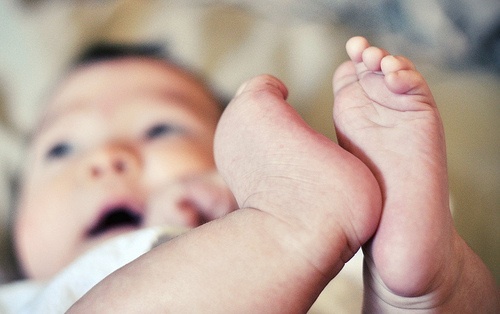 I was disappointed that I hadn’t had children yet when friends were getting pregnant and having babies and that I didn’t seem to be on any career path. When I was younger, I had imagined that by 30, I’d be, well, a grown up. A grown up with a job and a family. Turning 31 this week was a completely different experience. I felt so loved. On my birthday, I was 24 weeks, 3 days pregnant and 2 weeks, 2 days into a new full-time job. Thirty might have gotten off to a rocky start, but it ended up being a pretty important year for me (although I still don’t feel like a grown up). When I told JB that I wanted our child to only play with simple wooden toys in order to foster his or her imagination, he laughed. 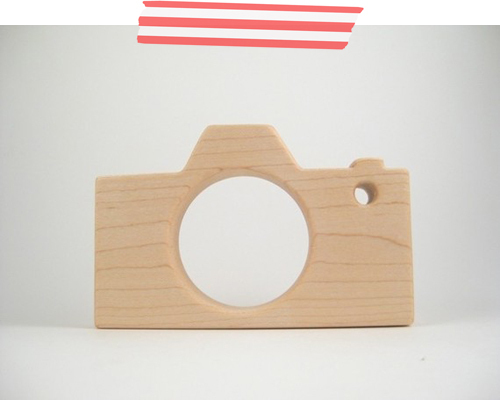 Still, the photographer and wannabe-hippie in me loves this wooden teething camera.